I send you herewith a Regimental and General Orders, and an extract from the clothing receipt roll of Sergt. Muller (5) and Corpl. Nickerson (6), clothing issued by Lieut. McLean (7). I also send you Duplicate Receipts for Ordnance and Horse Equipage which I have directed Sergt. Bishop (8) to leave behind as I do not think you would want to be troubled with old equipage and ordnance at Jefferson Barracks, when you will probably get an entire New Equipment for your Company. If you should want any horse equipage I have receipted for a good deal of New Equipage that was sent on for the different Dragoon Companies, and which has never been used, and if you are not able to equip you Company entirely at St. Louis, I may be able to help you. Colonel Wharton (9) has at last indirectly applied to join the Army in the field, he will probably get an answer before the middle of next month. We got a mail from Santa Fe a day or two ago. Grier (10) had a fight with the Indians, it seems they have runned off some cattle, Grier followed them, but owing to the bad condition of the mules of his party, only himself, Lieut. Wilson (11) and two men were able to come up with the Indians; they killed two of the Indians and Grier’s horse or mule whatever it was, shot under him. (12) The Dragoons under Burgwin (13) have been ordered to the Passo to protect the traders. (14) He writes very despondently, says, if his men were only Dragoons he might do something. 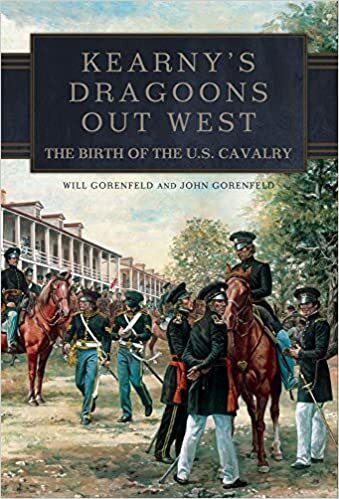 I hope that Colonel Wharton joins Scott or Taylor that he will [take] some more Companies of the 1st Dragoons down with him. If he could get four or five Companies it would be a very pretty command. How are you getting along at Dayton. Did the Girls give you a warm welcome? I was not able to send you a copy of your estimate for clothing because by some mistake it was sent off without a copy being attached. If there should by any possibility be any thing new here, I will let you know. (3) In 1846, the Ringgold saddle was the official saddle for the mounted arm. It was not until March 7, 1848, that an Army board approved the Grimsley saddle as the official pattern. (Stephen Dorsey & Kenneth McPheeters, The American Military Saddle 1776-1945 (Collectors’ Library, Eugene, Ore. 1999), 20. (4) The original of this letter may be found at the Indiana Historical Society in Indianapolis. The author wishes to express his deep appreciation to Mrs. Besty Caldwell for making a copy of this letter available. (5) German-born First Sergeant Frederick Muller had been with the Dragoons since 1834. He was thirty-five years of age and was six foot-one inch in height. Lt. Love wrote of Muller that, “whether in battle, in camp, or on the march, he is energetic and soldierly; never in one instance have I known him to neglect his duty.” Sergeant Muller donned the scarlet trimmed jacket of an Ordnance Sergeant. He served in this capacity until his death in 1861 at Fort Wood in New York harbor. (Report of John Love, House Ex. Docs., 30 Cong., 1 sess., No. 1, 120.; (War Department Files, National Archives, Lt. John Love’s Company B, Muster Roll Records, 28 February to 30 April, 1847. (Hereafter, Muster Roll). 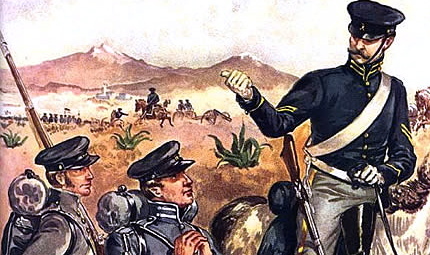 (6) Trooper John F. Nickerson enlisted in the 1st Dragoons in 1841. Promoted to the rank of corporal in June of 1847, on February 6, 1848, he received a surgeon’s discharge. (Muster Roll, Company B, 1 January to 28 February, 1848.). (9) Lt. Col. Clifton Wharton. 1st Dragoons (Heitman, 1022). (14) During the most of Mexican War, there was lively trade betweenAmerican merchants in Santa Fe and Mexican merchants in Chihauhua. (See generally, Edward James Glasgow and William Henry Glasgow, Brothers on the Santa Fe and Chihuahua Trails, edited by Mark L. Gardner (Niwest, Colo, Univ. Colorado Press 1993). (16) Capt. Richard Ewell to Lt. William Nichols, 10 February 1855, Letters Received, Department of New Mexico, RG 393, National Archives.